Ann Luk leads digital marketing at the Parker Institute for Cancer Immunotherapy, a nonprofit that accelerates ambitious research to make cancer curable. She creates marketing programs that convert audiences into users and brand advocates. 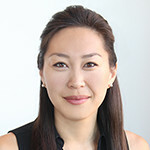 She previously led digital marketing for CardioDx, a cardiovascular genomic diagnostics company. Prior to CardioDx, she held product marketing and communications roles at McKesson Specialty Health where she promoted an oncology EHR and launched new drug and technology product lines. Ann holds a BA from the University of California, Berkeley.